It is a good time to measure crop residue, or the stems and stalks remaining from last year's crop. Crop residue provides a very important cover for the soil during this time of year, shielding soil particles from heavy rainfalls and erosion until crops can produce a protective canopy. In a normal rainfall, raindrops of 6 millimeters in diameter can hit the ground at 20 miles per hour. The cumulative impact of millions of raindrops hitting the ground in a normal rainfall can be very destructive to topsoil. With no crop residue to protect the soil from the impact and erosive properties of rainfall, the pounding of raindrops can quickly dislodge soil particles, moving them up to 3 feet away from their original location. The process of "soil splash" is only the beginning of the problem. The splashed particles begin clogging soil pores, effectively sealing off the soil's surface, resulting in poor infiltration. Rainwater also starts to collect and move down slope, carrying with it dislodged soil particles. Often, this process causes severe rill erosion or the formation of gullies. Crop residues retard the process of soil erosion by limiting soil splash and protecting the soil's surface from the direct erosive impact of raindrops. Therefore, crop residue increases water infiltration rate by reducing water runoff velocity. High levels of residue translate directly into better soil conservation, but what is considered a high residue level? Most experts agree that conservation tillage practices must leave at least 30 percent crop residue cover after planting to be considered as a conservation tillage practice--or one that retains high residue levels. Knowing how to measure crop residue as new crops emerge helps determine how well soil is protected from water erosion, and the success of your conservation plan. How does your crop residue measure up? Use the following techniques (line transect, meter stick, photo comparison, and calculation) to determine your residue cover. The best estimates are the averaged results of repeated measurements at several areas in each field (exclude end-rows). 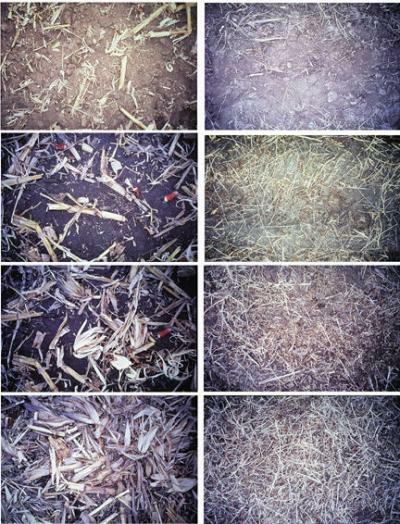 Compare your fields' residue cover to that in the photos herein that show a known percentage of crop residue. Remember that the perspective from an angle can be misleading. Look straight down when comparing photos. Calculation is a good way to get a rough estimate of remaining residue without going to the field. But remember that it is only a general guide and may not reflect what is really on the field because too many variables, including weather and differences between operations of tillage equipment, are involved. See Table 1 for information on residue cover percentage remaining on the soil surface after each operation . Multiply the factor for each operation by the existing percentage of residue left to find how much residue cover will be left after each operation. Table 2 gives an example of calculating residue losses from fall harvest to after corn planting. First, determine the percentage of existing residue cover after harvest and then multiply that by the percentage of remaining residue after each following operation. Conclusion--more residue equals less erosion. Strive for at least 30 percent crop residue after planting. It's one of your best allies in fighting soil erosion. Table 1. Crop residue cover percentage after various operations. Table 2. Example of calculating residue losses from fall harvest to after corn planting. Corn (left) and soybean (right) residue cover percentages (25, 50, 75, 90). The percentage of residue coverage increases from top to bottom for each crop in a column. Photos are courtesy of Nebraska Extension publication G95-1134-A, Estimating Percent Residue Cover Using the Photo Comparison Method (D.P. Shelton and P.J. Jasa). This article originally appeared on pages 69-71 of the IC-488 (8) -- May 13, 2002 issue.